Ganguly, A., Ghosh, S. (2011). A Review of Ventilation and Cooling Technologies in Agricultural Greenhouse Application. 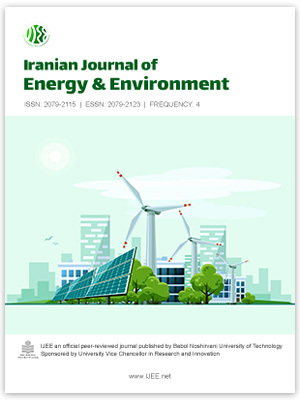 Iranian Journal of Energy and Environment; previously called: Iranica Journal of Energy & Environment, 2(1), -. A. Ganguly; S. Ghosh. "A Review of Ventilation and Cooling Technologies in Agricultural Greenhouse Application". Iranian Journal of Energy and Environment; previously called: Iranica Journal of Energy & Environment, 2, 1, 2011, -. Ganguly, A., Ghosh, S. (2011). 'A Review of Ventilation and Cooling Technologies in Agricultural Greenhouse Application', Iranian Journal of Energy and Environment; previously called: Iranica Journal of Energy & Environment, 2(1), pp. -. Ganguly, A., Ghosh, S. A Review of Ventilation and Cooling Technologies in Agricultural Greenhouse Application. Iranian Journal of Energy and Environment; previously called: Iranica Journal of Energy & Environment, 2011; 2(1): -.